Custom built cedar fences, gate installation and repairs. High End Cedar Fence Alternatives. World Class Products. Elite Installation. Providing you with specialty low maintenance and maintenance free cedar fence alternatives manufactured in Canada or the USA – NO EXCEPTIONS. We make the decision and installation process of your fencing seamless and work hard at exceeding your expectations! Our elite installation team will make sure the finished product exceeds your expectations. Our team is highly trained, fully qualified and very professional. Westminster Fence & Deck is a small business that has been building custom cedar fences and decks since 2002. with a large portion of work subcontracted from much larger companies. We are now offering more direct to consumer sales. While using high quality materials and workmanship, our goal is to provide a beautiful new addition to your backyard at a fair price. High quality custom cedar fencing and decks built on-site. Our Fences are hands built on site. We do not use pre-built panels. This provides a much longer lasting fence, allows balance in panel size(no odd tiny panels at the end of a fence run) and also allows us to shift posts as needed to avoid harming existing vegetation in your yard while providing solid posts. Whenever possible, the boards from your old fence will be kept from the landfill and recycled as planters or “reclaimed” furniture. Westminster Fence & Deck provides tear down and removal services for your existing structure. After demolition and clean we will rebuild your new cedar fence or cedar or plywood deck, ready for whatever finish you decide. Have an arbor or trellis in mind? How about a custom cedar project? We do all of that too! Have a look at our gallery to see how we can make your next idea a reality. Our founder Andrew Bader started Diamond Shovel at the young age of 16. Since then, we have grown to serve the entire lower mainland offering world class residential and commercial landscaping services and more. We pride ourselves in offering the best possible work and supplies to make every job perfect. 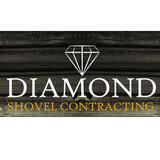 We are a team of dedicated landscapers, maintenance managers, wood workers, stone workers, installers and machine operators with over 50 years of combined experience. From a new retaining wall to a new custom stamped driveway, we can do it all. Premium Quality Fencing and Outdoor Living Spaces. Brent Mitchell started Premium Fence Company in 1985 -in his backyard in Richmond. It was a one-man show back then –he did both the estimates and the installations –while his wife helped with typing and paying the bills. He always believed in treating his customers like he would want to be treated, and that is something that still guides us today. Read more about our story here: <a rel="nofollow" target="_blank" href="https://premiumfence.ca/our-story.html">https://premiumfence.ca/our-story.html</a> Our specialty is fence and deck replacement, and we show extra care and attention for established lawns and gardens. As part of our care for the environment we recycle any existing structures we remove, in order to reduce our carbon footprint. Premium Fence Company gets most of its business from referrals and has also had many clients call them for the second time, to replace fences we built in the eighties! We're committed to giving you a real pleasant experience with our team. Our goal is to create RAVING FANS, and we will not let you pay until you are 100% satisfied with the finished project. Graybar Metal Works LTD, is a unique metal works manufacturing company that began in 1998. We have many years of experience in automatic driveway gates, steel and aluminum glass railings, fencing and gates, steel security window bars and custom metal manufacturing. Our goal is to make and install metal products to our customers' satisfaction. Our success ever since we started has been the positive referrals we get from satisfied customers. We are committed to provide the best high-quality products available with top-notch customer service. We stand by our commitment in all our manufactured products, that we provide 10-year warranty to all of our aluminum materials. Cedar Creek Fencing offers a great variety of hand built, cedar fences, fencing solutions, deck designs, lattice structures, pergolas, custom arbours (arbors) and gates. We work with you to bring your plans and creativity to life! At Cedar Creek Fencing we stand for nothing less than honesty, integrity and quality. We believe customer service is the easiest thing to get right and the most detrimental thing to get wrong. At the end of the day we want your trust as well as your business. We are the real deal and we stand behind that policy. 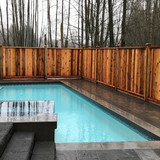 Quality Custom Cedar Fencing has been a custom fence builder throughout the Lower Mainland for the last 17 years and has over 2,500 satisfied customers.We’ve done work for some of BC’s biggest builders and many of BC’s great people and families. British Columbians are some of the best people in the world and as such, appreciate quality. And because they know quality, they trust Quality Custom Cedar Fencing time and time again. A quality product – properly installed – will increase the value of your property. We accept work anywhere from West Vancouver to Hope British Columbia. Trust the team at Discount Fence in Skagit County, Washington, to provide a wide range of options for you. You can choose from wood, vinyl, chain-link and metal fences, as well as security solutions such as barbed wire, razor wire, security fencing, and secured gates. Our fencing company provides fence installation, repairs, supplies, and do-it-yourself packages for residential, commercial, and industrial customers. We will work within your budget and timeline to provide the best fencing solution available. Bioules Home and Garden based in beautiful Maple Ridge, British Columbia, Canada is a full service, fully insured professional Home Renovations and Landscaping company providing service to the Tri Cities areas of Port Moody, Coquitlam and Port Coquitlam, all of greater Vancouver and the lower mainland. It is our goal to overachieve on every project so that your space becomes ideal for you…more practical, efficient and beautiful in the ways that you need it to be. For over ten years, Avant Guard's Gates has been providing our customers with automatic gate access controls solutions in British Columbia. Avant Guard automatic gate access solutions are of the highest quality and are consistently reliable in all applications. Avant Guard Gates is a full-service company in Vancouver BC, offering a full-spectrum of products and services from original driveway gate design to access control systems for residential and commercial properties, as well as preventative maintenance contracts and service of automated gates and gate openers in and around Vancouver. Natural Art Concrete Fence Ltd. In business for over 15 years, we have changed the concrete fence industry with a revolutionary manufacturing process developed here in Canada. We created the Canus Concrete Molding System in order to have a cost-effective production line that provides the flexibility and stringent quality control standards needed to meet the varied needs of our customers. Our fencing is perfect for a range of applications, from individual homeowners to condominiums and the largest highway projects. Our products are approved for use by the British Columbia and Alberta highways departments and feature a 50-year design life. The same high quality components are used in residential and commercial projects. We strive to meet and exceed high expectations and quality standards when it comes to building concrete walls! Whether you need to secure your yard or just add some decorative flair to your landscape, fences are an integral part of a home’s exterior and curb appeal. Given their security and aesthetic importance, they need to be designed, installed and repaired correctly — luckily, fence contractors in Kendall, WA can help. From devising custom fence designs to general fence repair and maintenance, these pros will have your fencing looking fancy in no time! Your Kendall, WA fence installation and repair professional will work with you to create your ideal fence. Fence installation or replacement. 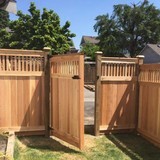 If you are in the market for a brand new fence, a contractor’s services will include walking you through various fence styles and materials, determining a suitable height, ensuring that all fence designs and plans are compliant with Washington building codes, and that the fencing meets both your stylistic and security needs as the homeowner. Fences and gates must complement the grade of your property as well as the type of soil you have, so the contractor should always plan around these considerations. Additionally, if you don’t know exactly where your property lines are, he or she can commission a survey for you. Find a fence contractor in Kendall, WA on Houzz. Narrow your search in the Professionals section of the website to Kendall, WA fence contractors. You can also look through Kendall, WA photos to find examples of fencing and gates that you like, then contact the professional who worked on them.